Pursuant to the Section 135 of the Companies Act, 2013 (hereinafter refer as “the Act”) read with the Companies (Corporate Social Responsibility Policy) Rule, 2014, the Company is required to adopt the Corporate Social Responsibility (CSR) policy in the organization to add sense of responsibility and contribution among corporate which is expected to be Beneficial to different class of people such as children, women, uneducated, unemployed etc. towards which such CSR activities may be focused. The Companies Act, 2013 has introduced the idea of CSR recently but your Company is voluntarily following it since last many years. Our Company believes the policy which is more and more beneficial to the society at large by promoting and encouraging economic, social and educational development and also giving active support to local initiatives around its area of operation thereby promoting upliftment of people in varied arenas of life. This commitment is beyond statutory requirements. Corporate Social Responsibility extends beyond philanthropic activities and reaches out to the integration of social and business goals. These activities need to be seen as those which would, in the long term, help secure a sustainable competitive advantage. 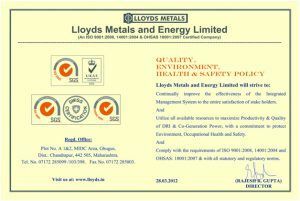 We “Lloyds Metals and Energy Ltd is already doing a remarkable performance in its CSR activities in the Vidarbha region of Maharashtra and it should come with more such initiatives in the near future,”.